Some novel research on the social networking phenomenon has turned up a slightly surprising result: The most influential spreaders of news aren’t necessarily those with the greatest number of online friends or followers. The research is coming from a study made at Boston University, and it’s all about k-shell decomposition in social networks–but more on that later. 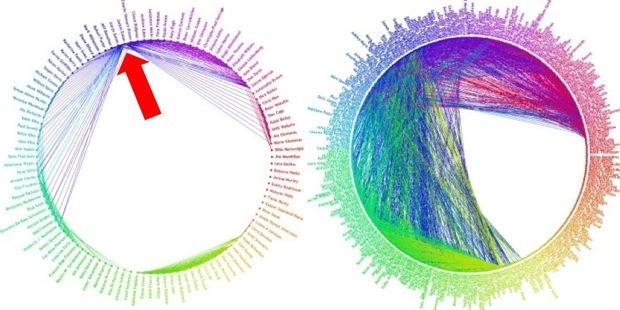 Until this research, lots of thinkers have concentrated on the idea that the people with the most connections (the highest “degree centricity” if you’re talking in network analysis terms) hold the keys to spreading new information best through a social network. This jibes with the common-sense thinking you’d probably develop yourself if you took the time to try and work out how, say, gossip spreads through the office water cooler grapevine. And at one level, it is true: If you have very few people connected to you in a social network, it may take more “leaps” between other people for your news to gain a wider audience. Now Boston’s Maksim Kitsak looked at the networks in a different way, breaking down the complex Web of people’s friendship groups into k-shells (essentially a simplification of the number of neighboring nodes people have into those with connections numbering greater than k: A person with more connections has falls into a higher k-shell). Kitsak then examined whether people who were most effective at transmitting information through a social network corresponded to high k-shell people. And in many cases, this wasn’t true. Instead, the structure of a network and where people were placed within it were just as important. Imagine this scenario: You’re the high k-shell person for your workplace, connected to lots of pals. But if your friend network is confined to just one of your company’s divisions, then you personally may be poor at communicating to the greater network. Now imagine someone who’s not as well-connected as you, but sits in a strategically significant spot within the network instead–though their influence may seem less, it could actually be much greater: They might be friends with the right sort of people. The upshot of this research? Well, like the recent revelation that you’ll get more Twitter followers with fewer personal Tweets, it suggests something subtle: If you’re a PR person, and you want to achieve broader attention to something you’re Tweeting, you should perhaps concentrate less on getting huge numbers of followers. Instead, you should be trying to attract the key followers among the hoard, with enthusiastic participation in the network, and good onwards communicating power.